Barack Obama’s response to violence in Charlottesville has now become the most “liked” tweet in the history of Twitter. The quote was divided into three separate tweets. 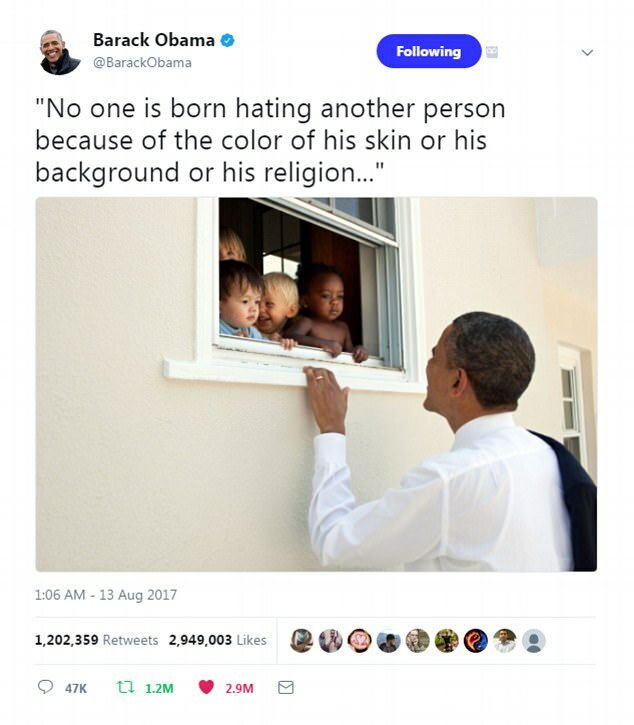 The first, which so far has received 2.9 million “likes”, was accompanied by an image of young children looking down at Mr Obama through a window. Photographer Pete Souza took the photo in 2011 at a daycare facility next to Mr Obama’s daughter Sasha's school in Bethesda, Maryland. Previously, the most-liked post on Twitter – with 2.7 million likes – was Ariana Grande’s tweet following the bombing at the Manchester, England arena, where she was performing in May. Mr Obama’s post-Charlottesville tweet knocked Ellen DeGeneres' iconic Oscars selfie with Bradley Cooper and other celebrities out of second place, according to online service Favstar, which tracks Twitter and Twitter usage.